Many central Indiana residents rarely think about it. Others have been told to avoid it. But now, several organizations are working together to make the White River a gem that attracts people to live, work and play near its banks. Hamilton County Tourism is partnering with the City of Indianapolis and other partners to develop the White River Vision Plan, a comprehensive look at the 58 miles of the river in Hamilton and Marion counties. The initiative was launched in May and has included dozens of meetings with stakeholders and opportunities for the public to provide input. The next public meeting is set for 6 to 8 p.m. Oct. 23 at Founders Park, 11675 Hazel Dell Parkway in Carmel. Attendees will have the opportunity to give input on the plan designs, express concerns and ask questions. While many things can be done to improve the White River, much progress has been made in previous decades. A century ago, the river experienced “pig jams” when meat producers would throw hog carcasses in the river after removing the parts they wanted, according to Cliff Chapman, executive director of the Central Indiana Land Trust, which works to preserve land along the river and elsewhere. The river may no longer be full of pigs, but other hazards have caused ecological devastation and contributed to a negative reputation. Most notably, in 1999 a chemical spill near Anderson led to a fish kill, and other pollutants at times led to officials to urge people not to make full body contact with the water. Even now, in Indianapolis, sewage overflows into the river when it rains more than a quarter inch. The $2 billion DigIndy project is creating a 28-mile tunnel system deep underground to nearly eliminate the problem. In Hamilton County, where most development occurred more recently than Indianapolis, modern designs have kept the problem to a minimum. But for years now in both counties, the White River has been deemed a safe place to enjoy outdoor recreation. In addition to the DigIndy project, other major projects are in the works along the White River, such as the transformation of the former General Motors stamping plant in downtown Indianapolis to a $550 million mixed-use project. Conner Prairie, which borders 3 miles of the river, is in the process of completing a master plan that includes using the water to provide education about Indiana history. Myers said it seemed like a good time to launch the White River Vision Plan with so many organizations already focusing on improving the river. The plan doesn’t seek to replace the work that’s been done by other groups; rather, it aims to unite organizations that are already working toward the same goals. Other partners include the White River Alliance, Friends of the White River, Reconnecting Our Waterways and more. Massachusetts-based Agency Landscape + Planning is consulting on the project. The project costs $1.5 million and is funded through several municipalities, Legacy Fund and a grant from the Nina Mason Pulliam Charitable Trust. The partners have different focus areas, but all are committed to helping the White River reach its full potential. Not only does the White River Vision Plan aim to clean up the river, but it is exploring ways to increase access and attract development. “We’re always looking for more family activities to get the average person to realize the fun there is to be had on this great recreational opportunity,” Lantz said. At the same time, the group is cognizant of the fact that many private landowners don’t want to see big changes. “We’ve heard loud and clear from residents that while a lot of people would like to see more trails along the river, a lot of people would not like to see connected trails because it goes through private land,” Myers said. 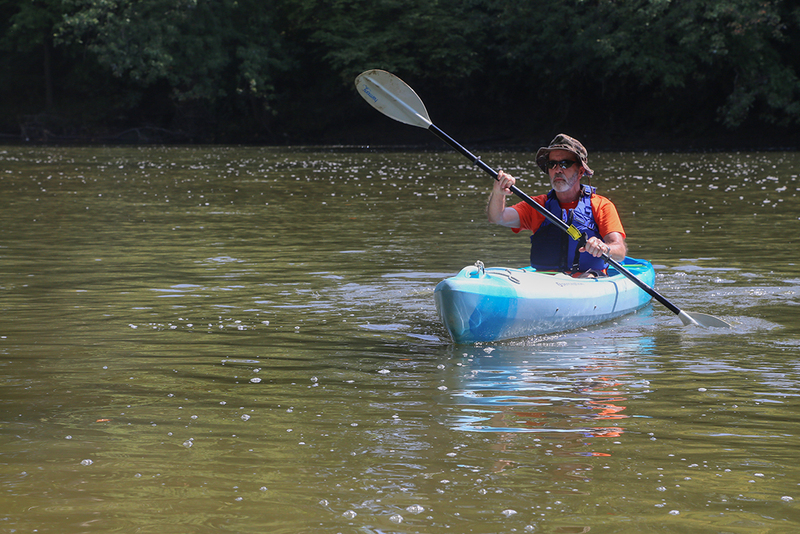 Ed Shaugnessy, a Carmel resident who enjoys fishing and kayaking on the river but doesn’t live on it, is also hoping that the vision doesn’t lead to drastic changes. The boat launch at Carmel’s Hazel Landing Park is being used as inspiration for a new White River access point at Oliver’s Woods, a 53-acre nature preserve near Keystone at the Crossing in north Indianapolis, according to Central Indiana Land Trust Executive Director Cliff Chapman. Oliver Daughtery left his property, which includes a mile of frontage along the White River, to the land trust upon his death in 2009. It is planned to include walking trails and mountain bike trails among the woods and prairie-savanna restoration areas in addition to the boat launch. The site is expected to open to the public in the spring of 2020.